The average person sees over 1,000 adverts everyday. Increasingly advertising is becoming more targeted though, powered by the new wave of connected data-gathering devices. Renew, a company specialising in recycling are looking to take this further though, with their Wi-Fi enabled smart-bins. Smart bins work by detecting the Wi-Fi on the smartphones of passes-by. 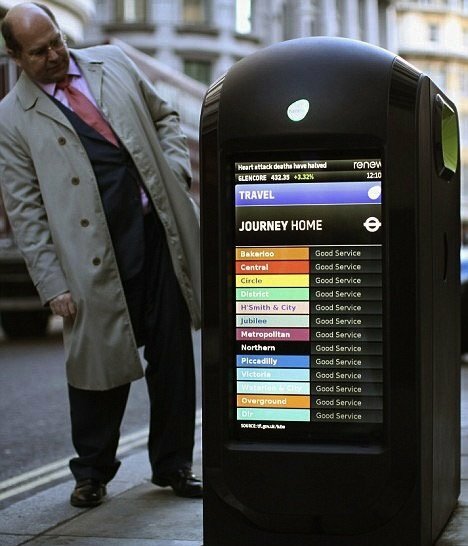 The bins intercept these signals with the aim of snooping on these passers-by, with the ultimate capability of delivering targeted adverts. The bins first appeared in London immediately before last years 2012 Olympic Games. They feature a large led screen, which has already been used as advertising space, as well as a general information panel for Londoners. Originally 100 were installed in London, but recently renew upgraded around twelve of these bins in order to fit the Wi-Fi tracker. So what information are Renew trying to gather about us? The information is not especially sensitive. The first layer looks to decipher your phones manufacturer and model. The next layer of data involves your location. The bins will look to identify where you’re heading to – or at least what direction you’re going in. They can look for frequency patterns to learn more about you. Do you go that way every Monday to Friday at 8:15am? Or is this a one off visit, perhaps miles away from your regular clustered routes? All of this is usual advertising data, enabling offline to use the type of targeted ads that online have been using. So will we now be chased around the high street with the same ‘re-targeted ads’ as we soon online? Concerned about this level of tracking? Visit Presence Orb and opt out. Presence Orb are the Analytics arm of the operation, and they’re current,y using the data to look at smartphone penetration in London. So is this another step too far in a world where we’re increasingly tracked? Next articleWhat are the most popular shows on social media?